We do a lot to make our rear ends look good. Wait, not that rear end! I am talking about the tail section of our sport bikes. One of the most frequent aesthetic modifications in the sportbike world is cleaning up the stuff sitting out back. These modifications are usually designed to make the motorcycle look more lean and clean. Kawasaki's ZX10 Ninja is a great looking motorcycle out of the crate. 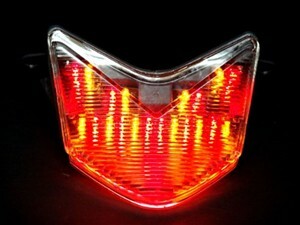 However, its appearance can be enhanced by D2Moto's tail light and turn signals. These units are Euro-styled clear lights. That clear lens houses an LED circuit board with a blacked-out background. This is a simple bolt-on application that requires no further modification to the motorcycle. Thus, you can go back to the stock setup if you change your mind, or if you sell the bike. This unit is designed specifically for the United States model ZX10. It will not fit other models. Will your bike go faster or turn better with the D2Moto rear light kit? Well, no. However, you will look better as you pull away. After all, isn't that point of a good-looking rear end? If you prefer smoke to clear, here's another D2Moto tail light kit to consider. Hi how can I get this tail light in Australia for an 05 zx10?